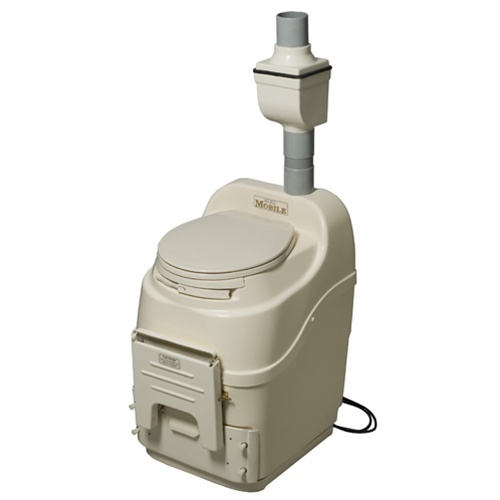 Portable Composting Toilet | Sun Mar MOBILE | Free Shipping! 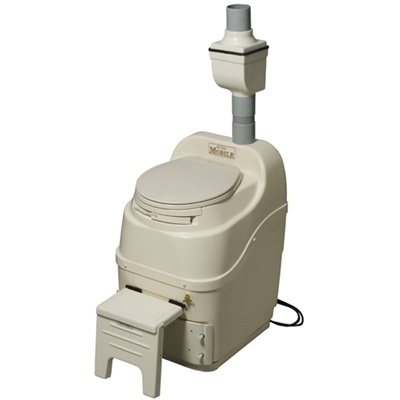 The MOBILE is a medium capacity self-contained composting toilet that's specifically designed for use on boats and RVs. This unit is certified by the US Coast Guard and is one of a kind. For the first time, people can go wherever they want without having to worry about pump outs. Now travelers can recycle their waste without polluting water and dealing with messy chemical toilets. Because the MOBILE needs to deal with potentially violent motion, it has been completely marinized, meaning that the finishing drawer is gasketed and the air intakes are baffled to prevent any leaks from escaping the unit. A special drum lock ensures that the composting drum is held upright under all sea or road conditions. The MOBILE also features a fold-away footrest with spring-loaded legs and a safety release mechanism so it can be easily removed for accessing the finishing drawer. Additionally, strong mounting brackets are attached at the rear and base of the unit, so it can be bolted to the floor in installation. The MOBILE features a vertical 3" vent stack coming out the top of the unit and running straight upward. In boat installations, it is optimal to have the unit vent above deck level, though we know that this isn't always possible. For that reason, the MOBILE comes with a filter box to be fitted into the vent stack. This filter contains zeolite and carbon for removal of ammonia odors and ensure odor-free operation at deck level. The MOBILE has various electrical components including a fan assembly to ensure odorless operation and a thermostatically controlled heater that warms and helps evaporate liquid. The MOBILE composting toilet has been tested and certified by the NSF for residential use and by the United States Coast Guard for use on boats. This means that it has been tested to NSF/ANSI Standard #41-1999, the only standard for composting toilets in North America, and it is certified to operate odorlessly and produce a clean, safe compost. For verification, please see Sun-Mar's NSF Listing and the U.S. Coast Guard Certification Letter. At the time of start up, add some Compost Sure (peat bulking material) into the Bio-Drum™ together with some Microbe Mix. The toilet will compost any type of toilet paper without problems. For ongoing operation, add Compost Sure as specified in the product instruction manual. Every 2-3 days, rotate the drum 5 or 6 full revolutions. When the Bio-Drum™ is half to 2/3 full, move some of the compost to the finishing drawer. This can be accomplished by simply releasing the drum lock and rotating the drum backwards. Finished compost will drop into the finishing drawer and you never come into contact with fresh material. When compost is moved to the finishing drawer, it should be left there for at least 4 weeks so it can finish and sanitize. In the finishing drawer, it will be isolated from contamination by fresh material in the toilet. 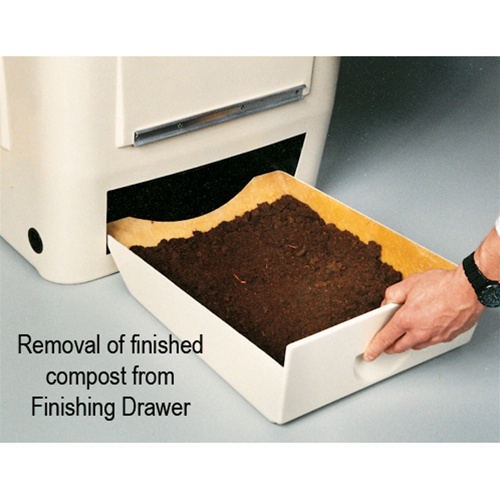 Once 4 weeks have passed, you can remove the finished compost from the finishing drawer at any time. The drawer is easily pulled out by hand without tools. The finished product is clean, dry, non-offensive, and sanitary. It will look and smell just like any other regular compost that might come out of a garden composter. Height of Footrest (when in use): 11-1/4"